This blog is presented in both English and Hebrew. Languages can be switched using the links on the side menu. Thank you for stopping by, and I hope you enjoy your stay. Eponym (from Greek, Eponymos, “name-giver”) is an name which provides the source for another item’s name (place/discovery/object etc. ), and vice versa. 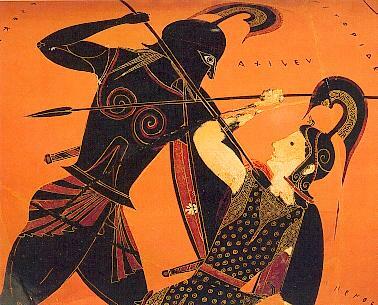 For example – Achilles is an eponym (name-source) for “Achilles’ Heel”, and vice versa. There’s a narrower definition that says that eponym is a proper noun (names, like John, London etc.) that became a common noun (objects, like chair, wall, etc.) – for example, “sandwich” after the British earl. While the second definition sounds more accurate to me, Wikipedia maintains that the first one is the one, and for the purpose of this post we will settle for it. The list of eponyms is almost endless, it seems1: diseases named after the doctor that identified them (Parkinson), or after a famous patient (Lou-Gehrig’s disease, ALS), astronomical discoveries, name of places, name of laws, and many many more. But this is all well known, maybe with the exception of the word “eponym” itself. I came across this when I watched an old Seinfeld rerun. George wanted to get back at his boss, and plans how he can “slip him a Mickey”. He even has his own Mickey source. Jerry asks where one gets this Mickey, and that he can’t believe he’s even saying “Mickey”, so who is this Mickey? At the late 19th century, there was this guy called Mickey Finn. He was a pickpocket and the owner of a local saloon in Chicago, by then the 2nd largest city in the US (today it’s 3rd), called “The Lone Star Saloon” (probably not the eponym for this Lone Star). He became famous at the early 20th century when he found new ways of turning a profit from his patrons. With the cooperation of his staff, he would spike the drinks of some of his clients, and when they passed out, he would rob them and throw them in an alley nearby. The victim would wake up, remembering nothing, thinking he probably had too much to drink, and went home. 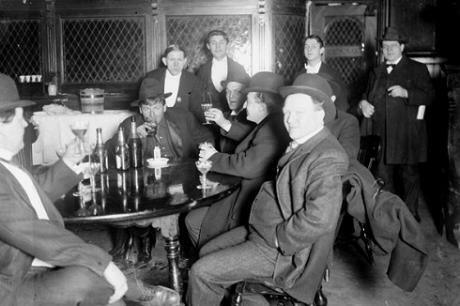 In 1903 Mickey was arrested by police, and although he was not jailed for his actions, a special committee heard his case, and after hearing testimony from one of his waitresses, one Mary “gold tooth” Thornton, his liquor license was revoked, and he left town for a few years. Years later he was arrested again in Chicago for running a pub without a license. As it happens in English, his name soon became a noun – a Mickey, and a verb – to Mickey someone, or to Mickey-Finn Someone. A few years later, in 1918, more than a 100 waiters working in a Chicago hotel were arrested after they used to slip Mickeys to customers who haven’t tipped enough. It wasn’t the same Mickey – the point of the drug was not to neutralize the customer and rob him, but simply revenge. The original drug was Chloral Hydrate, a drug that is still used today as an anesthetic. These waiters used something called an antimony potassium tartare, that causes headaches, dizziness, vomiting, etc. Since then, the name became generic slang to something that is added to someone’s drink – be it GHB or simply a laxative. 1 Maybe not endless, because Wikipedia tries to compile a comprehensive list of them. Good luck with it. Scotland was in the news lately, with its independence referendum. The local news here knew to quote the fact that Scotland has been a part of Great Britain for some 300 years. 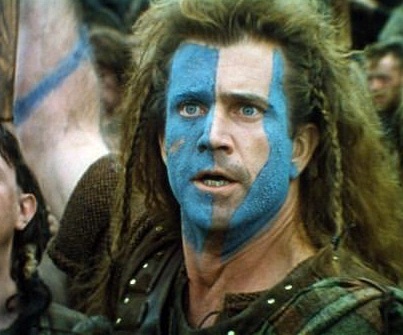 I guess that when people hear of Scottish independence, they see an image of Mel Gibson with some paint on his face, but that doesn’t really has to do with the issue on hand. Gibson portrayed William Wallace, a military leader in the First War of Scottish Independence at the late 13 century (and the usage of the word “first” here can give you a hint on how it ended), about 400 years before the union. So what was the deal? Until 1603 the Scottish kingdom and the British kingdom (that included Ireland) lived separately. Every once in a while, someone invaded the others’ lands, fought, killed, died, and retreated. In 1603, the Virgin Queen, Elizabeth Tudor, Queen of England died. She was the 2nd daughter of King Henry VIII and his second wife, Ann Boleyn, and the last monarch of the Tudor Dynasty. Elizabeth never married and never had children, and in addition refused to publicly announce a successor. But privately she chose one – King James VI of Scotland. Why him? James’ great-grandmother was Margaret Tudor, older sister to Henry VIII. Both of James’ parents were Margaret’s grandchildren (yes, they were cousins). James’ mother, Mary Queen of Scots was held prisoner by Elizabeth for 19 years and ended up losing her head. But that is another story and shall be told another time. Anyway, after Elizabeth died, King James VI of Scotland took the throne. Now King James I, the first king to rule both Scotland and England and held it for 22 years. He established the American colonies in America, and is remembered mostly by the bible translation that still carries his name (King James Bible), and by being the target of Guy Fawks and his co-conspirators in the Gunpowder Plot in 1605. His ascension to the crown is known as “The Union of The Crowns“, but it wasn’t a political union of the states. England and Scotland kept their independence, with separate parliaments but with one king. We’ll skip 44 years to 1649. The throne is held by James’ son, Charles I, and things are a bit bleak for him. Seven years before, a civil war started, and Charles, who led the Royalist forces against the Parliamentarians, lost. Since 1645 he’s been sitting in prison, and although he managed to escape for a short while, he was captured again. Charles would not live to see much of 1649. By the end of January he would be a head short. England abolished the crown and went into a period of 11 years of parliamentarian rule, under Oliver Cromwell. But Cromwell died, and not long after, the monarchy was restored. The throne was taken by Charles II, son of the first, that stayed in exile for the past few years. Charles II died with no heirs and the throne went to his brother James, who became James II. James lost his crown in another revolt, named the Glorious Revolution (named so, because in comparison with other revolutions this one was relatively less bloody) and fled to exile. His place was taken in 1689 by his daughter Mary and her husband William, and then, when they died in 1702, by his other daughter – Ann. Both sisters, Mary and Ann, never had any children, and with Ann’s passing in 1714, the Stuart dynasty has ended. During Ann’s reign the union between England and Scotland was complete with the Acts of Union of 1706-1707, that were passed in both parliaments. These acts have sealed the political union between the realms on top of the union of the crowns. And that is the Union the news were talking about. So just a quick recap: Elizabeth I -> James I (Union of the Crowns, 1603) -> Charles I -> Civil War & Parliamentarian rule -> Charles II -> James II -> Mary & William -> Ann (Acts of Union, 1706). Ann had no heirs. The place of the Stuart dynasty was taken by the Hanover Dynasty, with King George I, son of Sophia of Hanover – the grandchild of James I. One of the first terms you come across wen you try to learn more about a language is “proto-language” – the (sometimes) theoretical language out of which other languages came to be. English, for example is classified as an Anglo-Frisian language, which is a group of the East Germanic languages, that are in turn a group in the Germanic languages and they are only a part of the Indo-European languages. This family of languages include English, Spanish, Russian, Gaelic, and Persian. In fact, Wikipedia says that 12 of the top 20 languages, in terms of native speakers, are Indo-European languages. Researchers say that all these languages come from a single, common language they call a Proto-Indo-European (abbreviated PIE). You can find evidence of that if you look at words that have similarities across different languages — e.g. the word for “Brother” in Sanskrit is bhrā́tar, in Persian it’s brātar , in Old Irish it’s brāth(a)ir, and in Tocharian1 – pracar. The PIE word for is bhréHter. Sometimes the influence can be seen only in part — the Latin words Semper, Simplex and Semel (Always, single, and sometimes respectively) come from the PIE root -sem-, meaning “one”2. Urheimat (from German, meaning “original homeland”, and pronounced OOrheimat), is the name given to the homeland of the people who spoke the proto-language. 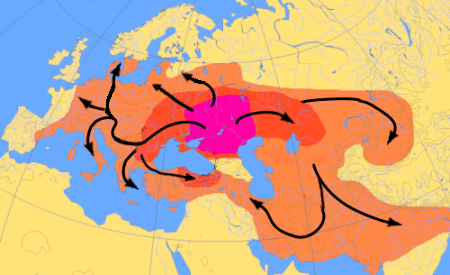 There are 3 main theories for the urheimat for PIE: the “Kurgan hypothesis”, placing it on the north shores of the Black Sea; the “Anatolian hypothesis”, placing it in Asia Minor; and the “Balkan hypothesis”, placing it, surprisingly, in the Balkans. Other urheimat theories are equally numerous and interesting. The same term is also used to describe not only the “top-level” proto-language, so there’s a hypothesis for the urheimat for proto-Germanic (somewhere in what is now north Germany, at a place called Jastorf), for the proto-dravidian language3 etc. 1 Tocharian is a language that went extinct at about the 9th century, and was in use in what is now north-west China. And yes, I have used the most esoteric example available. 3 The Dravidian languages include some 70 languages, including Tamil, Kannada, and Telugo. They are used in South Asia, mainly in India, and are spoken by more than 200 million native speakers. A really cool chart of the Indo-European language. Historical Linguistic – the study of the change of languages over time. On the eve of The Six Days War, France, then Israel’s largest supplier of weapons and technology, imposed an embargo on the selling of weapons to Israel. This was a major problem for the Israeli army in general, and the Israeli Air Force (IAF) in particular. At the time, France supplied Israel with advanced weapons and technology, while other countries, such as England, Canada and the United States settled for selling outdated weapons if anything. Among the items that were affected were 50 Mirage V fighter jets, that Israel helped design, and already ordered and paid for. The IAF’s need only grew more a few days later, in the aftermath of the Six Days War and the beginning of what later be named the War of Attrition, where Israel lost more than 45 crafts. In an operation that much of its details remain obscure, Israel managed to obtain the Mirage V blueprints (some say through a Swiss agent working at the company that fabricated the engines for the Mirage V1), and using French spare parts (that were not included in the embargo), cooperation with several foreign factories, a wink and a nod of the French regime, and plenty of work and Israeli technology, the Israeli Aerospace Industries (the IAI) built its first fighter jet, the IAI Nesher (Hebrew for “vulture”), in early 1971. The Neshers were extensively used during the Yom Kippur War of 1973, where they managed to shoot down 111 enemy jets. Later, they were gradually replaced until they were decommissioned in 1978. Some of those jets were then fixed up and sold to the Argentinian Air Force. Israel continued with its efforts, and attempted to replace the engine of the Nesher with a different one designed by General Electric, that Israel has fabricated with a license. As a result, by 1975 Israel introduced its newest fighter jet – the IAI Kfir (Hebrew for “baby lion”). The Kfir featured technological improvements and better maneuverability and was in use by the IAF from 1975 to 1996. Various variants were manufactured, and sold (with American consent) to Columbia, Sri-Lanka, and Ecuador. Some jets were also used by the American army in fighting simulations. The later South-African fighter jet, the Atlas-Cheetah was based on the Kfir. Israel continued with its efforts and spent great resources on the Lavi Project (Hebrew for “Lion”), and the IAI Nammer (Hebrew for “Tiger”) in the 80s, but despite reaching advanced levels and test flights, these projects were cancelled, and the existing prototypes were scrapped into aluminum bars. The technological challenges of designing and fabricating an aircraft, let alone a fighter jet, are massive, probably more than I can ever understand. The fact that Israel, a very small state with very limited resources, managed to manufacture hundreds of them (with some cooperation) is nothing short of remarkable. 1 The man, Alfred Frauenknecht, was charged and convicted in 1971 for the theft of the Mirage V blueprints. By his own admission, he received $200,000 from Israel. He was sentenced to 4.5 years in jail, and died of a heart attack in 1991 at the age of 64. A book reviewing the achievements of the Israeli Intelligence Agencies. The book is also available via Google Books. China is the world’s 3rd largest country. It spans 3.7 million square miles (9.6m sq. km) and 3,230 miles (5,200 km) east-to-west. and still, since the Chinese Civil War, this entire region (plus Tibet) uses one uniform hour — UTC +8. To compare: the contiguous United States is, on average, 3,000 miles (4,800 km) across, and it spans 4 different time zones2 – East, Central, Mountain, and West, UTC -5 to UTC -8 accordingly. China’s landmass, on the other hand, occupies 5 different standard time zones – from UTC +5 to UTC +9, and it’s not a mere happenstance that China’s capitol, Beijing, is located on UTC +8 as well. Such uniformity of time on such a large scale can pose certain challenges to the population — sunrises at 3am or at 10am, standard working hours, and standard opening hours for governmental services, such as the post service. In theory, when you look at Earth’s longitudes, each time zone should be 15 degrees, and the time within this zone should be its average time. For example, UTC+0 is crossed by longitude 0 and spans 7.5 degrees to its east and west, and that is why GMT is so named — Greenwich Mean Time. 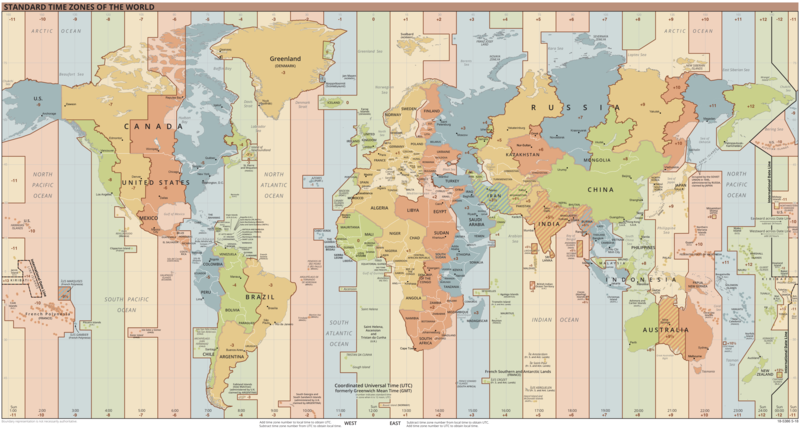 But since time zones are a human invention, the final word on time zone assignments is a local, political issue, that can create some mismatches: Argentina and Bolivia are on the same longitude, but they don’t share time zones. Bolivia is at UTC -4, while Argentina chose to be more like its large neighbor, Brazil, and stayed at UTC -3, even though technically it occupies UTC -4 and UTC -5); In the US, most of Indiana is on Standard Eastern Time, but some counties in its south is on Central Time; Some countries have set their time to fractions – India, for example, is at UTC +5:30 and Australia’s Central Standard Time is UTC +9:30. There are also a few that apparently 1/2 an hour was too clean for their taste, and skewed the clock even further — Nepal, for example, is at UTC +5:45. 1 UTC is a compromise between the French Temps Universel Coordonné and the English Coordinated Universal Time. In the past, people used Greenwich Mean Time (GMT) as a point of reference to the rest of the world, but since the introduction of the atomic clock, it turned out that GMT is not accurate enough on the sub-second level. These days GMT is still used casually, but UTC is technically preferable. 2 If we want to nitpick (and why wouldn’t we? ), Wikipedia states that by law, the US recognizes 9 time zones for official purposes (such as dealings with the governments etc.) – the four that were already mentioned, two for beyond the contiguous United States – Alaska at UTC -9 and Hawaii at UTC -10, plus 3 more for the Unincorporated territories of the United States – Atlantic Time, UTC-4 for Puerto-Rico and the US Virgin Islands, Samoa Time, UTC -11, for American Samoa, and Chamorro Standard Time, UTC +10, for Guam and the Northern Mariana Islands. 3 Although officially, the Chinese government only recognizes one time zone, China’s westernmost province, Xinjiang, uses its own time zone. As a kid, I was once told that Mach speed is a unit of measurement equal to the speed of sound. In fact, as it turns out, it’s the result you get if you divide the speed of the object with the speed of sound at the same environment. Maybe more importantly, they failed to explain that the speed of sound changes as a result of different environmental settings, mainly temperatures, since the speed of sound drops at low temperatures. That means the actual speed (in mph) the unit “mach” represents is not a constant. At sea level and a temperature of 15°C (59°F) Mach Speed = 1,225 kph (761 mph), and at 35,000 feet, which is the cruising altitude of commercial air jets, and where the temperatures are -56°C (-68.8°F) Mach 1 = 1,063 kph (660.7 mph). That’s about %13 slower. Additionally, I did some reading about the technical specs of fighter jets, e.g. 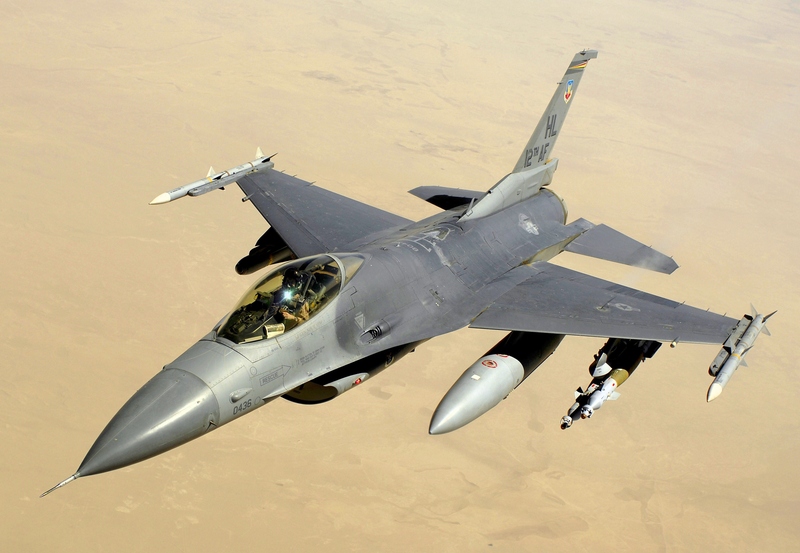 the F-16 Fighting Falcon. The spec sheets indicate a maximum speed of Mach 1.2 at sea level (1,470 kph, 913 mph) and Mach 2 at high altitudes (2,120 kph, 1,317 mph). I figure the differences are because of lower air resistance at high altitudes, but couldn’t figure what’s the importance of the first figure, since fighter jets do their cruising and fighting mainly in high altitudes and not anywhere near sea level. 1 I expect this will not be my last post that will deal with sometimes basic concepts in physics and other exact sciences. The extent of my ignorance in such fields can be embarrassing sometimes. Mach Number in NASA’s web site. I’m watching Starz’ The Outlander, based on a series of books by Diana Gabaldon1, that I have not yet read. The show takes place in Scotland in the 18th century, and I must admit that I don’t know much – neither about the place nor the time. Since I liked the show’s theme song, I tried to look it up, and the first results brought me to a song with the same melody, but different lyrics. Turns out this song is a small adjustments of lyrics to a poem by Robert Lewis Stevenson, renowned author of Treasure Island and The Strange Case of Dr. Jekyll and Mr. Hyde, among many others. These lyrics were built on the tune of a Scottish folk song named “The Skye Boat Song“. While Stevenson’s lyrics are somewhat romantic and nostalgic, the original Boat Song is a ballad about the escape of Prince Charles Edward Stewart (“Bonny Prince Charlie”) from British forces following the defeat at the Battle of Culloden and the end of the Jacobite Rising of 1745, and it is a song about death and destruction. The historical story about the Jacobites, Bonny Prince Charlie, and the Battle of Culloden are worthy of a post of their own. What caught my ears in the theme song were words I didn’t recognize, such as Skye, Mull, Rum, and Eigg. A quick online search showed me these were the names of islands in the Inner Hebrides – part of the western archipelago of Scotland. Scotland’s geography and its history seem fascinating to me, and with the show concentrating on the time before the Battle of Culloden, I expect to read and learn more about the time and area. 1 Dr. Diana Gabaldon holds three degrees in science: Zoology, Marine Biology, and a Ph.D. in Quantitative Behavioral Ecology. She spent a dozen years as a university professor with an expertise in scientific computation, and sounds like an awesome woman. Discussion about The Skye Boat Song and Robert Louis Stevenson’s poem, including differences and the story behind the songs. You mean you’ll put down your rock and I put down my sword, and we’ll try to kill each other like civilized people? War is an ugly business, but it doesn’t mean it can’t be civilized. At least in the past, when people had to kill each other face-to-face, and not through the air at the press of a button. First way to go about it is to reach with your army and face your enemy. At that point, each side chooses one person (sometimes called a champion), and they alone fight. Winner takes all. The losing side can sometimes even keep their heads, as they are sometimes taken for ransoms, not to mention the thousands or tens of thousands of ordinary foot soldiers that are spared. Such fights were more common in ancient times, and include, for example the epic battle between Achilles and Hector in Homer’s Illiad. But say you already raised an army and marched it a long way, maybe you want to get your money’s worth and have it fight (not to mention the wages you don’t have to pay dead soldiers) — it’s really unnecessary to kill civilians and destroy cities while you’re at it. In somewhat similar fashion to what later be dubbed “a quick draw duel” in the Wild West, both armies set a time and a place for the battle in advance. An additional improvement on this scheme is the army’s option to withdraw prior to the battle (or shortly after it began) without the second army pursing and destroying it. This type of battle was part of the chivalry code and practiced during the middle ages. One such battles took time during the first English Civil War in 1642. I’ll be remiss in my geekiness if I don’t mention in that context the classic Star Trek episode “A Taste of Armageddon“, in which two powers are fighting each other through computer-simulated bombardments in order to avoid the collateral damage to their society and environment. Nowadays, the term “pitched battle” is used to describe a conflict which its place and time were anticipated. Yes, I know it’s a bit strange opening this blog with an entry about the Ku-Klux-Klan, but I happened to stumble upon the subject when reading about the big mess in Ferguson, Missouri in early August. To recap – a (white) police officer, named Darren Wilson, got into an altercation with Micheal Brown, an unarmed 18-year old. This altercation ended with at least six bullets in Brown’s corpse – 4 in the body and 2 in the head. Following the shooting there was an outcry of the local population, sometimes violent, that lasted for more than 2 weeks. These events were covered by practically every media outlet in the US and overseas. Wikipedia tells me that the KKK went through 3 phases, none of them good: the first was between 1865-1874 during the reconstruction era in the south following the Civil War. The second phase was between 1915-1944 and introduced such innovations like a burning cross. During its peak in the phase, the clan had about 6 million members, but facing criminal activities of its leaders and external opposition, this number dropped to about 30,000. The third phase was between 50s and the 60s, and between the 70s to the present. Needless to say that all 3 phases were violent, and included the lynching of black Americans, anti-semitism and other terrorist activities. When I started reading, the first thing that caught my eye was the origin of the name. Wikipedia says that it’s probably derived from the Greek Kuklos, meaning “circle”. This seems a bit idiosyncratic to me – a Greek word just lying there, but then I got to read a bit about their slang, and titles, and found it hard to keep a straight face. The entire Klan field of jurisdiction is called an Empire, with the different states called Realms. Each Realm could have up to 3 Dominions, and any number of Provinces (equivalent to a county). The Empire is led by an Imperial Wizard, who has a team of ten Genii. He has an Imperial Exchequer and an Imperial Scribe. The Realm is led by a Grand Dragon and a team of eight Hydras, plus a local (grand) Exchequer and Scribe. The Dominion is led by a Grand Titan and a team of six Furies, plus the local Exchequer and Scribe. The Province is led by a Grand Giant and a team of four Goblins, plus the local Exchequer and Scribe. So a short recap: Wizard > Dragon > Titan > Giant. Proudly powered by WordPress | Theme: Beach by Gibbo. | Copyrights CC BY NC 4.0 International License.